Last November, Science, Technology and Innovation Week was held, organized by the University of the Basque Country (UPV) in all three Basque capital cities (Bilbao, Vitoria and San Sebastián). Workshops, scientific stands, educational itineraries, exhibitions, contests, samples, excursions, guided tours and much more were all part of the 16th edition of Science Week. Fagor Automation, in collaboration with UPV and in order to present its technology to visitors, conducted a demonstration of a motor on November 3, 4 and 5 at the Kursaal Congress Centre in San Sebastián. 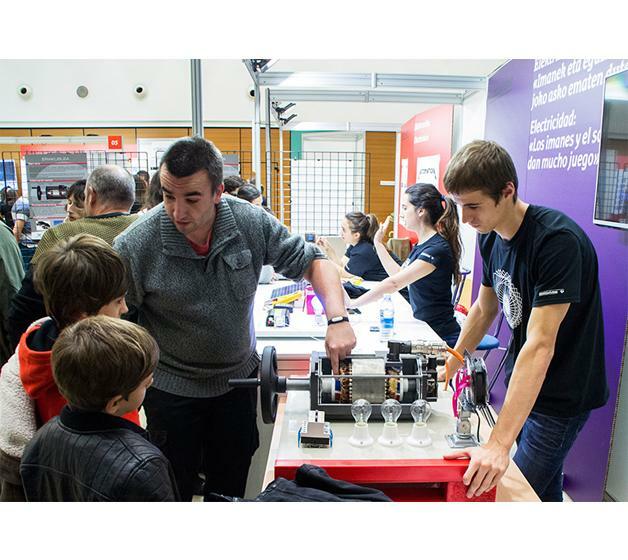 The machine was exhibited at the UPV stand dedicated to electricity and magnets. Three models were on display at this stand, each representing a field of electrical engineering. The stands were set up in a circle so that people could easily go from one to another, as they wished. The fact that this year 2016 the organization chose the Kursaal Conference Centre as the venue enabled more people to see the exhibition, which received a great influx of visitors at all times. In the words of Vicente Moreno, professor in the electrical department and person responsible for the stand, the demonstration given by Fagor Automation proved to be a great attraction for adults, children and teenagers alike. The event met expectations and showed old and young alike the amount of energy and force needed to supply electricity and light up our homes, while stressing energy improvement and the reduction of wasteful consumption in our homes.